I’ve been talking to multiple congregations as of late concerning how new members came to join their church. In nearly every case (limited sample), new members belonged to another congregation before joining. That is, they were informed consumers (used in as non-perjorative a sense as possible). They already knew what it meant to be a member of a congregation and they knew what kinds of things they were looking for in a new church. Not surprisingly, they were looking for friendly people, good worship, and, in some cases, programs for their kids. Most of the new members interviewed received little help in making their decision. Churches often assume that visitors know how to make their way and can make inferences and connections about the meaning of Christian rituals and other such things all on their own. I asked one group of new members if they needed more help figuring things out. They responded that that might have been nice, but they didn’t really require it. This same group, however, also reported that their involvement at church past Sunday morning attendance was minimal. They knew that they could join ministries and were confident they could figure out how, but had not to this point taken the initiative. They were content with the rather passive processes in place and the rather low expectations that went along with that. I asked this same group of experienced church consumers if they had no church background whatsoever if they would have had enough help to join the congregation. It was clear to them that this would not be the case, that people with little familiarity with how congregations work might very well be overwhelmed or feel out of place. I kind of have this image in mind. 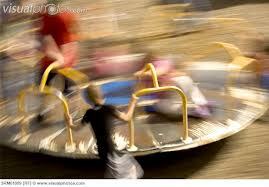 The church in worship is like a spinning merry-go-round on a school’s playground. Most churches expect that visitors can run alongside until they find a place to grab and jump on. 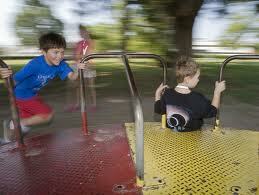 Others know to stop the merry-go-round from time to time to make joining easier. This is only part of the story, however. Here’s the deal. Some of our congregations do well orienting visitors to congregational life. Others not so much. But all of them seem to assume that the way one becomes a member is through visiting on Sunday mornings. So, here’s the metric. Are people finding their way into congregational life in some other way than visiting on Sunday mornings. I was with my friend, Kim Seidman, a few weeks ago. She’s an episcopal priest who gets regular reports on membership from her diocese and the number she always looks for as a sign of vitality is adult baptisms. These are people who are joining in some way other than the rather passive, high context, processes reflective of transfer growth. I like this, but I like to put it another way. Does your congregation have new members who have first experienced Christian community in a third space? This would require that your congregation is doing Christian community in a space other than the Sunday assembly. By Christian community, I mean a group of persons becoming friends in the name of Jesus even if they do not yet belong to Jesus. Robert Webber, in his book Ancient/Future Evangelism, shows that the path to becoming a Christian used to be believe/behave/belong. The burdens of belief, however, in a scientific, post-Christendom era are significant and are now often the last thing that gets settled for people coming to faith. I think the opposite progression may now be more the norm: belong/behave/believe. It is less and less likely that congregations will grow significantly through receiving ready made Christians who show up at your door on Sunday mornings. Do you have stories of members whose path to “citizenship” is other than visiting on Sunday mornings? This entry was posted in Christian practice, missional leadership, Uncategorized and tagged joining, leadership, missional church, post-Christendom metrics, Robbert Webber. Bookmark the permalink. Almost weekly at the Kensington Community one hears testimonies of people who have newly come to Christ and who have changed not only their own lives but often other lives as well from knowing their Savior. One of the most recent was an unchurched father who decided he should start taking his kids to church. in short, this father gave his life to Christ and trusted God to give him the skills to lead a small group of 2nd grade boys. ( His own son was part of this group) That group of young men stayed in the group through high school and are now graduating. During services many of them testified to how this one “new” Christian stepping out changed their lives. Several of the young men are now hosting small groups of 2nd graders themselves. The enthusiasm of those experiencing new freedom in Christ is something that can not be contained, and it is contagious. I looked for videos of some of these testimonies, but you have to listen to the entire sermons on line. I guess this man found Christ through walking into a church, but he grew into a relationship with Christ by becoming close to a group of young boys and by sharing life with them. Thanks, Paula. Stories like these are important indicators of health. The Palo Alto Church of Christ is the unnamed (but pretty obvious) host of two weekly events that have been gateways for drawing occasional people into our Sunday morning worship, as well as for stimulating some to reengage in a church more suited to their previous experience. Lifetree Café (http://lifetreecafe.com/) and FriendSpeak (http://www.friendspeak.org/) are our two current gateways. Lifetree is a community event held on Sunday nights in the multipurpose room/kitchen that has been transformed into a café atmosphere. We promote the event mainly through Meetup and Craigslist as a way to give the community a chance to talk about all kinds of topics. For example, this month’s topics are on the illegal status of children who immigrated, prayer, taming your mind, imperfect parents, and transgenderism, based on turnkey products from Group, Inc. During the evening, the content will involve sharing new information (statistics, definitions, myth-busting…), swapping stories among table foursomes, viewing exclusive video interviews or stories, offering a short prayer and highly relevant scripture. Through that listening and seed-sowing event, everyone is challenged and stimulated, and we all learn new points of view. A couple of people have (at their own instigation) checked out the Sunday morning assembly, and one has gradually been drawn in and gotten involved in FriendSpeak, the domestic equivalent of Let’s Start Talking. We hold FriendSpeak in the same café room during our regular Sunday School timeslot, and most of the adults who would normally attend Bible class now instead have an international language partner who is excited about practicing English conversation and learning some of the roots of American culture by studying Bible texts. (We share the building with a Korean church, so there’s plenty of hubbub going on, and it’s not awkward for our international friends to enter and leave without looking like they’re playing hooky from church.) We also involve our Friends in occasional social events beyond the conversation hour (e.g., inviting them home for Thanksgiving), and a few have joined our regular assembly. We’ve done other things, too, This, as well as our former programmed discussion of music lyrics with spouses of international people at Stanford U, has been a slow but steady approach to kingdom growth and maturity. Surely there are more examples. This ministry reaches out to the street “kids” of Denver. The website (www.drybonesdenver.org) has several stories of lives being changed through the power of knowing Christ and knowing Christ’s people. Through Dry Bones the young people do experience Christ’s love. They often speak of being able to feel like like these ministers do not judge them, to feel like they are loved for who they are, and to feel like they finally have a family. http://www.drybonesdenver.org/stories/view/28 I must mention the leaders of this powerful street ministry: Matthew and Nikki Wallace, Robbie Goldman, Susan Zimmerhackel, and Rebekah Duke.